I have a thing for cocktails, like a big thing. But they must contain alcohol because a “mocktail” is like a summer without sun: simply not fun (for me anyway). I love drinking cocktails, but as I am a bona-fide lightweight when it comes to booze, I can never manage more than a couple without falling asleep or making a fool out of myself. I mentioned in an earlier post that around a decade and a bit ago I used to moonlight as a bartender. Even though it was a job I initially took on only to make a bit of extra cash, I ended up rather enjoying it. Being a somewhat social creature, I had the opportunity to chat to lots of people, learned how to mix a mean cocktail and became an expert at dodging the advances of drunken men. One of the cocktails I loved to make is the Martini. I was first introduced to this drink at The Gin Palace, a dark plush little bar which reputedly never shuts, situated in Melbourne’s Russell Place. It was the late 1990’s and in those days I was actually skinny and brave enough to don very short black dresses and very high heels. I would perch myself upon a leopard skin velvet upholstered sofa, drink martinis late into the night and pretend I was on the set of a Peter Sellers film. Though I loved other cocktails, the martini seemed far more sophisticated. The martini has an interesting history and there is some debate as to its origins which, I believe, makes it all the more interesting. There are many ways to make one but the general consensus on this is that the authentic version only contains gin and vermouth, and the garnish must be an olive or piece of lemon peel. The first martini is recorded to have been created around the end of the 19th century and was originally a 1:1 ration of gin and vermouth. This dropped to 3:1 and 4:1 in the 1930’s and ’40’s. The ratio progressively dropped down further to little more than a whiff of vermouth in some versions, and in others, the gin was dropped altogether to make way for vodka. The actual name martini goes back to 1863 when an Italian vermouth maker started marketing their product under the brand name of Martini however there is some argument that the cocktail was invented by a bartender in San Franciso around the same time. Some well known individuals of times past enjoyed the famous tipple. English actor Noël Coward suggested that the ideal martini should be made by “filling a glass with gin then waving it in the general direction of Italy”. Winston Churchill was said to simply whisper the word “vermouth” to a glass of gin and of course there was James Bond who everyone knows wanted his “shaken, not stirred”. Well I think there are many ways to skin a cat so I went about creating three martini recipes which I admit may have strayed a little from the original of 1863, however do try to stay true to their ancestral roots. 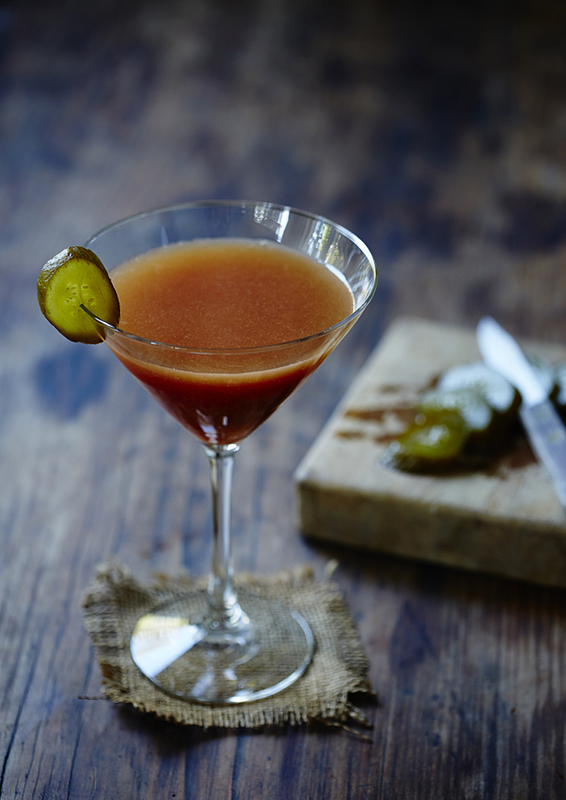 The three cocktails I created for this post are a homage to the original martini and draw their inspiration from Clint Eastwood’s Italian spaghetti western classic The Good, The Bad and The Ugly. (I like it said much better in Italian: Il Buono, Il Brutto, Il Cattivo.) After all, the martini can be all three. Dressed up or dressed down, the martini appears in many different forms, some more serious and others a little more tongue in cheek. So here are three incarnations I came up with for you to enjoy the next time you feel cocktail hour coming on. Whether you shake these or stir them is entirely up to you. Pictured above, this Middle Eastern beauty is dressed in fuschia and is as exotic as she looks. She mixes both vodka and gin with sour cherry juice and the delicate aroma of roses. Place ice into a cocktail shaker then add all ingredients in the order they appear. Shake then pour though a fine strainer into a cold martini glass. 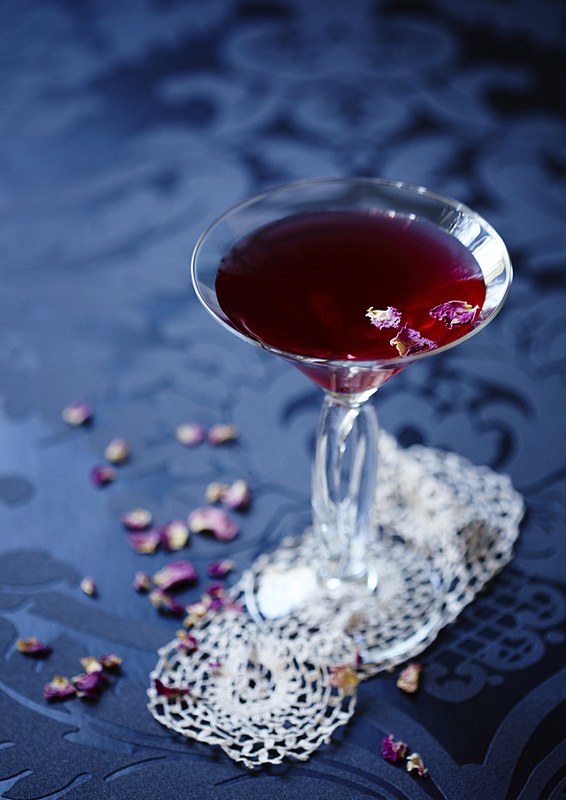 Garnish with dry or fresh edible rose petals. 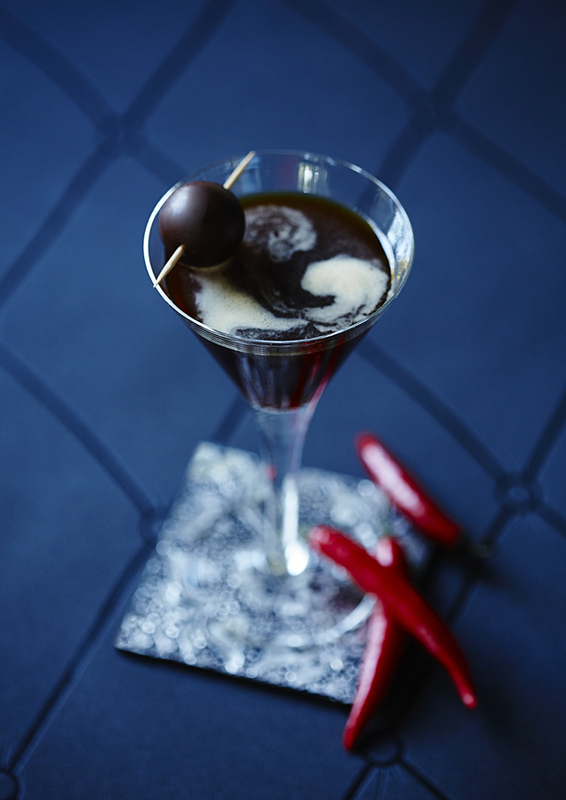 Russian pop star extraordinaire Phillip Kirkorov and his smash hit single Chilli Chacha inspired this mix of caffeine and chilli to create a cocktail guaranteed to send your pulse racing. Down a couple of these and you’ll soon be doing your very own Chilli Cha-Cha in a big fur hat and tight leather pants. Place ice into a cocktail shaker then add all ingredients in the order they appear. Shake then pour through a strainer into a cold martini glass. Garnish with chocolate curls or a dark chocolate Lindt ball on a toothpick. This cocktail is like that guy you see across a crowded room who isn’t particularly attractive but has so much charisma you can’t help but stare at him. This dude is smooth, slightly salty and rather intoxicating. Before you know it you’ll be giving him your phone number and inviting him in for a nightcap. Place ice into a cocktail shaker then add all ingredients in the order they appear. Shake then pour into a cold martini glass. Garnish with a pickle slice. Melbourne’s Gin Palace and it’s flamboyant owner Vernon Chalker were the inspiration for this shoot. As a past regular of the Gin Palace (and former Melburnian) I would occasionally strike up a conversation with the dapper gentleman and enjoyed listening to his musings of how much he loved his establishment. The décor of the Gin Palace is much like Vernon: luxe, bohemian, a lot of velvet and very Melbourne. I used dark wood and beautiful lush wallpapers from Eurowalls in Sydney for the backgrounds to invoke the atmosphere of a late night bar. All the martini glasses were picked up at the Salvo’s as were the additional bits and pieces. The only light used in these photographs is window light. Love the inspiration from Clint’s film: they DO sound better in Italian. Unfortunately I don’t have a lot of photographs of myself from that time, and probably a good thing in some cases! As for the fur hat, I have a couple of authentic Russian ones I can lend you. I can’t wait to try the Persian Princess. If I can find this mysterious rose sherbert. Is it the same as rose water?